As good as Cleveland’s defense was last weekend, the offense had a forgettable performance, failing to find the end zone despite amassing 298 total yards and nearly 43 minutes of time with the football. 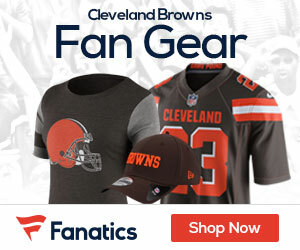 The Browns rank tied for 27th in the league in scoring at 16.2 points per game and saw quarterback Colt McCoy (1377 passing yards, 8 TD, 4 INT) sacked five times versus the Seahawks. He threw for 178 yards and was picked off once, but continues to build a repertoire with rookie wide receiver Greg Little (25 receptions). The 2011 second-round pick matched running back Chris Ogbonnaya with five receptions versus the Seahawks off a club-high seven targets. Little has 17 catches over his last three games and is tied for second among NFL rookies in receptions. McCoy also tried to get Joshua Cribbs involved, targeting the playmaker six times, but they hooked up just once for nine yards. The Browns’ 29th-ranked run game was without Peyton Hillis (211 rushing yards, 2 TD) due to a hamstring injury, with backup Montario Hardesty (238 rushing yards) running for 95 yards on a career-high 33 carries in his place. Hillis is questionable for this game, as is guard Shawn Lauvao, who suffered a knee injury versus Seattle. Wide receiver Mohamed Massaquoi (18 receptions, 2 TD) and tight end Benjamin Watson (20 receptions, 2 TD) both suffered concussions in the win as well and are both doubtful for Sunday. Cleveland may have to lean on McCoy in this game, given that the 49ers rank second against the run (74.7 yards allowed per game) and are yielding the fifth fewest points with an average of 16.2 per game. San Francisco has also not allowed a 100-yard rusher in 28 straight games, the longest active streak in the NFL, and have done a great job of taking the ball away as well. They are tied for third in the league with a plus-8 turnover differential and rank third in the NFC with 14 takeaways. Though San Francisco ranks 22nd in the league against the pass, it leads the NFL with 29 passes defensed and is the only club in the league to not allow a rushing touchdown this season. Excellent play at the linebacker position is the club’s strength. NaVorro Bowman (56 tackles) leads the Niners in tackles, logging 13 versus the Lions, fellow inside starter Patrick Willis (47 tackles) is one of the best in the game and 2011 first-round pick Aldon Smith (11 tackles, 5.5 sacks) leads all rookies in the conference in sacks from his outside spot. He also posted a safety versus Detroit and has a sack in three straight. Defensive tackle Justin Smith (22 tackles, 4.5 sacks) added 1 1/2 sacks against the Lions. San Francisco’s secondary has grabbed eight picks on the season, led by cornerback Carlos Rogers’ three and two from Tramaine Brock. While the defense has done its job taking the ball away, the San Francisco offense has held on to it. 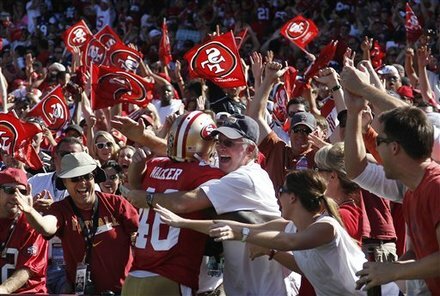 The 49ers are tied for second in the NFL with only six turnovers and rank sixth with 27.8 points scored per game. Running back Frank Gore (541 rushing yards, 4 TD) is leading the league’s sixth-ranked rushing offense, which is averaging 131.5 yards per game and 193.3 over the past three games. Gore posted 141 yards and a score on just 15 carries versus the Lions, giving him three straight games of over 125 rushing yards and a touchdown. He is just 110 yards shy of passing Roger Craig (7,064 rushing yards) for second place on the club’s all-time list. Gore’s ability to make plays lightens the load for quarterback Alex Smith (1090 passing yards, 8 TD, 2 INT). The signal-caller, who has 12 passing touchdowns in his previous six home starts, threw for just 125 yards against Detroit on 17-of-32 throwing. Wide receiver Michael Crabtree (20 receptions) was targeted 15 times in that game, making nine catches for a team-leading 77 yards. Ted Ginn Jr. (6 receptions), Walker (11 receptions, 3 TD), Vernon Davis (24 receptions, 3 TD) and Gore all made two catches each. The Browns could see a heavy dose of Gore if the Niners wish to avoid their second-ranked pass defense, which is yielding just 172.0 yards per game. That total has helped Cleveland rank fourth in total defense (291.0 ypg) and eighth in points allowed at 20.0 per game. Last weekend, the Browns allowed the Seahawks to move the chains on just two of their third-down tries, and the 137 yards the team allowed was its fewest since 1993. The Browns are looking to hold teams to under 150 net yards or less in consecutive games for the first time since 1954. Safety T.J. Ward (33 tackles) logged his first career sack, one of three by Cleveland versus Seattle, and forced a fumble in the process that was recovered by linebacker D’Qwell Jackson (54 tackles, 2.5 sacks). Linebacker Chris Gocong (15 tackles. 1.5 sacks) also had a sack last week and rookie lineman Jabaal Sheard (21 tackles, 2.5 sacks) and Phil Taylor (23 tackles, 2 sacks) were credited with half a sack each. That brought Cleveland’s total on the season to 16, the most for the club through six games since logging 17 in 2001. Cornerback Sheldon Brown (17 tackles) also grabbed his first interception of the season in his 150th career game. Brown’s pick was the fourth for the Browns this year, with former 49er safety Mike Adams (12 tackles) leading the way with two. Cleveland was able to dominate Seattle last weekend in time of possession, but that won’t be the case in this game if it can’t stop Gore. The former Pro Bowl selection is riding a wave of momentum and logged 115 total yards from scrimmage in his only other meeting with the Browns. One way that the Browns held onto the ball versus the Seahawks was by converting 12 of their 24 third-down attempts. They have been successful on 46.7 percent of their third-down chances over the past three games, compared to 35.7 percent in the first three contests. If Cleveland can’t move the chains, it will need to pin San Francisco deep. The 49ers have started 15 drives in their opponent’s territory this season, first in the NFL, and have turned those opportunities into 50 points.